Asien gegen die Mitte des Funften Jahrhunderts. Zeit der Sassaniden und des Hunnen-Reiches. 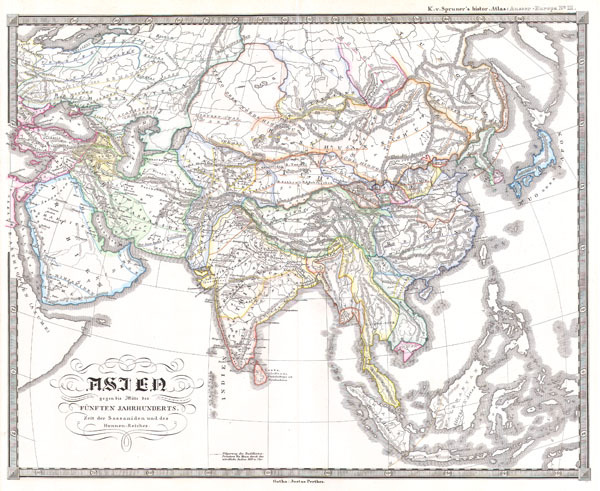 This fascinating hand colored map depicts Asia at the middle of the 5th century. This period corresponds with the period of the great Sassanid Empire and the Song dynasty of China. The Sassanid were a Zoroastrian Persian dynasty hailing from modern day Iran. All text is in German. Map was originally part of the 1855 edition of Karl von Spruner's Historical Hand Atlas.